You have done it again! This rivals "Framework" for animation and design. Well-done. Esp. 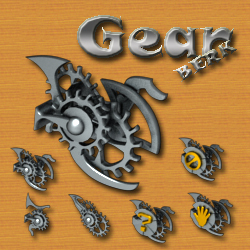 enjoy the way the gears move at different ratios. Thank You! Well this one tops them all!!! Absolutely a fanatastic piece of work. It's great to take a break and just watch the gears moving. Thank you so much. Incredible job. Two big , er, I mean Gears Up! These are just Great! Really awesome work. Berk, this is a Masterpiece! Thanks, i will try to create something better. ohyeah-the new king of cursors Artur Berk,,I am using it on OSX and it is so dang fine-fine as frogs hair! please do some more,bravo cursoro! This leaves the original 'gear' cursor behind in it's ultra-smooth wake! Top job, Artur ...many thanks to you. Yes, I like Gears. Very much.